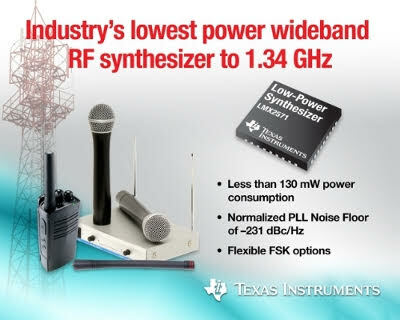 Texas Instruments (TI) (NASDAQ: TXN) today introduced the industry’s lowest power wideband radio frequency (RF) synthesizer. Covering up to 1.34 GHz, the LMX2571 integrates an ultra-low-noise PLLatinum™ fractional-N phase-locked loop (PLL) with a multicore voltage-controlled oscillator (VCO), enabling low phase noise and spurs at only 39 mA (128 mW). The LMX2571 enhances radio sensitivity and dynamic range for applications such as low-power wireless communication, handheld oscilloscopes and signal analyzers. An integrated frequency modulator enables the user to directly modulate the carrier to produce analog frequency modulation (FM) or frequency-shift-keying (FSK), benefiting portable wireless applications such as land mobile radios, software-defined radios and wireless microphones. Low operating power: Low power consumption of 39 mA (128 mW) supports battery-powered applications such as land mobile radios as well as portable test and measurement equipment. Low-noise PLLatinum fractional-N PLL: PLL noise figure-of-merit (FOM) of -231 dBc/Hz, eight times better than the competition, enhances receiver sensitivity. Flexible frequency modulation: An integrated FSK modulator with an easy-to-use I2S interface provides flexibility and performance. The FSK modulator meets the telecommunications standards of the European Telecommunications Standard Institute (ETSI) standards for wireless microphones and land mobile radios. Low spurious emissions: New spur removal technique can eliminate IBS, allowing engineers to maximize use of the radio channels in their designs. High level of integration: Integration of low-dropout regulators (LDOs), a 5-V charge pump, and a fast transmit/receive (TRx) switch reduces bill of materials and solution footprint. Engineers can quickly and easily evaluate the performance of the LMX2571 RF synthesizer with the LMX2571EVM evaluation module (EVM), available today for US$249 from the TI store and authorized distributors. TI’s WEBENCH® Clock Architect online design tool simplifies the design process for the LMX2571 as well as TI’s other clock and timing devices. The tool can recommend a single- or multiple-device clock tree solution from a broad database of devices to meet system requirements. It features PLL loop filter design, phase noise simulation, and the ability for designers to optimize clock tree design for their performance and cost requirements. Support is available in the TI E2E™ Community Clocks and Timing forum, where engineers can search for solutions, get help, share knowledge and solve problems with fellow engineers and TI experts. The LMX2571 PLLatinum RF synthesizer is available today in a 6-mm-by-6-mm quad flat no-leads (QNF) package for the price of US$5.50 in 1,000-unit quantities. What Should You Do to Launch a Tech Business?